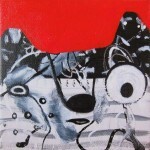 Riis Griffen, mixed media painting on old LP of “You Light Up My Life,” mounted on cradled wood panel. 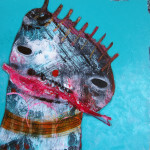 Riis Griffen, No More Candy, mixed media on 16×20″ canvas. Riis Griffen, Fighting Words. 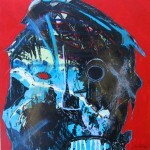 mixed media on 8×8″ wood. 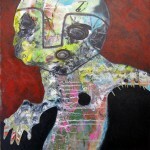 Riis Griffen, Octavian, mixed media on 16×20″ canvas. 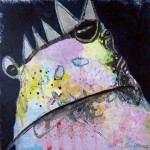 Riis Griffen, “Staredown,” mixed media on 8×8″ wood. 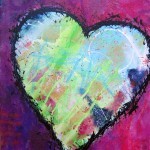 Riis Griffen, “Hole-Shaped Heart.” Mixed media on 24×24″ canvas. 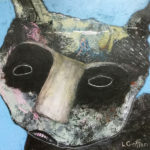 Riis Griffen, Black Sheep, mixed media on 8×8″ wood panel. 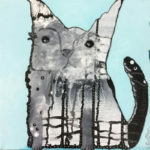 Riis Griffen, Come Back Jack Kerouac, mixed media on wood, 8×8 inches. 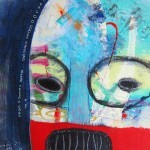 Riis Griffen, Helmet Head, mixed media on wood, 8×8 inches. 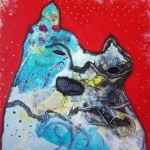 Riis Griffen, Hand of Friendship, mixed media on 8×8″ wood. 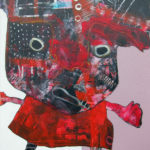 Riis Griffen, Red Scarf, mixed media on 8×8″ wood. 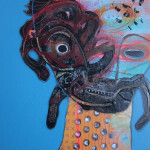 Riis Griffen, News of the World, mixed media on 8×8″ wood. Choke. 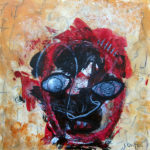 Mixed media painting by Riis Griffen on 12×12″ paper. 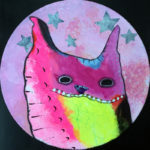 Riis Griffen, Wise Beyond Your Years, mixed media on 8×8″ wood. 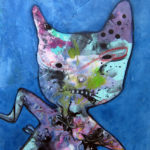 Riis Griffen, Awkward Phase, mixed media on 11×14″ gessobord. 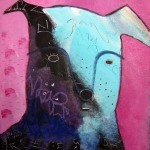 Riis Griffen, Wishbone, mixed media painting on 16×20″ canvas. 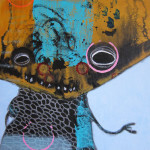 Riis Griffen, Smiling on the Inside, mixed media on 8×8″ wood. 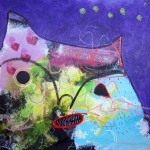 Riis Griffen, Pajama Party for One, mixed media on 8×8″ wood. 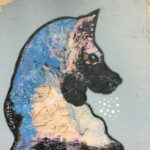 Riis Griffen, Old Soul, mixed media on 8×8″ wood. 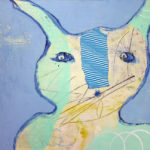 Riis Griffen, Summer Bunny, mixed media on 10×8″ board. 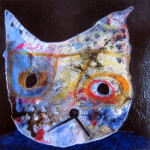 Riis Griffen, Humphrey, mixed media on 8×8″ wood. 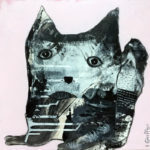 Riis Griffen, Boris, mixed media on 8×8″ wood. 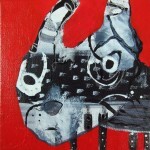 Riis Griffen, George, mixed media on 6×6″ canvas. 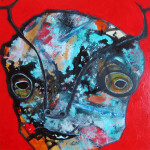 Riis Griffen, Bertrand, mixed media on 6×6″ canvas. 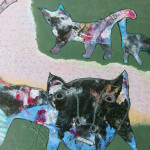 Riis Griffen, Cats and Kittens, mixed media on 20×16″ canvas. Riis Griffen, Wheeee! 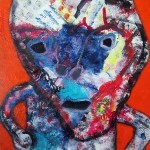 mixed media painting on 14×11″ canvas. 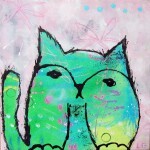 Riis Griffen, Snarky the Cat. 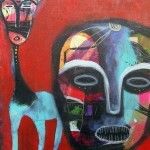 mixed media on 8×8″ wood. 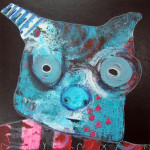 Riis Griffen, Cicero, mixed media on 12×12″ cradled board. 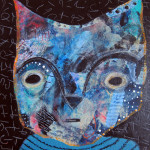 Riis Griffen, Atticus, mixed media on 12×12″ cradled board. 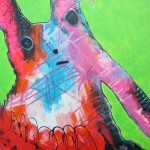 Riis Griffen, Siren Bunny, acrylic and oil pastel on 16×20″ canvas. 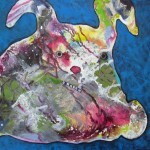 Riis Griffen, Bad Influence Bunny, mixed media on 20×16″ canvas. 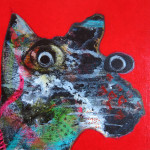 Riis Griffen, Banjo, mixed media on 12×12″ canvas. 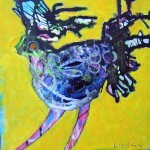 Riis Griffen, Shake Your Tailfeathers, mixed media on wood, 8×8 inches. 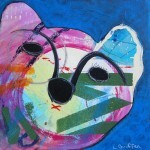 Riis Griffen, MBear, mixed media on 8×8″ wood. 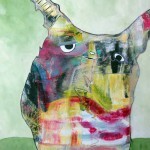 Riis Griffen, Spirit Animal, mixed media on canvas panel, 16×20″. 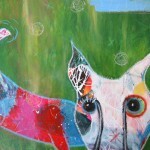 Riis Griffen, Open Heart, mixed media on gallery-wrapped canvas, 11×14. 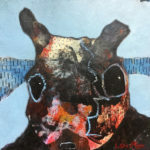 Riis Griffen, “Sancho,” mixed media on 12×12″ canvas. 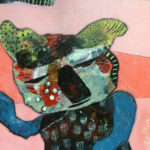 “Groove Thing” by Riis Griffen. 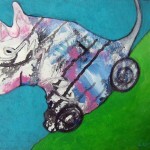 “Wild Thing” by Riis Griffen. Riis Griffen, Frog Princess. 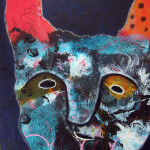 mixed media on 8×8″ wood. 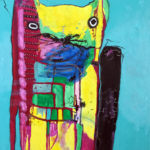 Riis Griffen, Wag, mixed media on canvas panel, 20×16 inches. 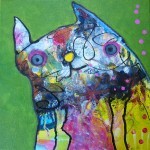 Green Cat, mixed media on gallery-wrapped canvas, 10×10 inches. $60. 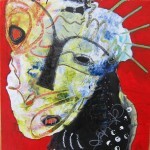 Riis Griffen, “Inez,” mixed media on 12×12″ canvas. 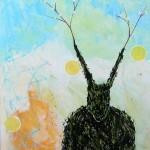 Riis Griffen, “Spring Growth,” mixed media on stretched canvas, 16×20″. Sold.